Now that Jurassic World: Fallen Kingdom has released on 4K Ultra HD, 3D Blu-ray, Blu-ray, DVD and On Demand, many Jurassic fans are feeling a bit nostalgic. While it's exciting to know that Fallen Kingdom is part of a new trilogy, many of us still have love for the prior Jurassic Park/World films. If you're a fan of the prior Jurassic Park/World film, then make sure to get the all-new five-Movie Collection now available on 4K Ultra HD, Blu-ray and DVD. Now fans can experience the glory of all five movies in one complete must-own set including, Jurassic Park, The Lost World: Jurassic Park, Jurassic Park III, Jurassic World and the all-new movie Jurassic World: Fallen Kingdom. 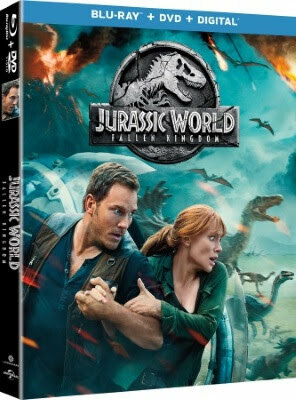 The newest installment of the action-packed Jurassic franchise, Jurassic World: Fallen Kingdom is now available on Digital and Movies Anywhere, as well as on 4K Ultra HD, 3D Blu-ray, Blu-ray, DVD and On Demand, featuring more than an hour of bonus content – including Chris Pratt’s behind-the-scenes “Jurassic Journals” captured on-set. Jurassic World: Fallen Kingdom continues to deliver adventure and thrills with the homecoming of beloved characters along with the introduction of new creatures that are more awe-inspiring and terrifying than ever before. Entries must be made on or before 11:59 p.m. September 24, 2018. I would love to win because I love the Jurassic Park movies. I have never seen any of the Jurassic movies. My hubby has seen some; my kids have seen some. And they tell me that it's time that I watched them! I want to win this prize because my only nephew Jon who has autism and is the sweetest young man ever, LOVES dinosaurs and is a mind boggling expert on everything about them and he was telling me how excited he was to see the new Fallen World movie so I thought he would really love the whole set, UNLESS I find out from his mom he already has them all (I don't think he does, but if I am wrong) then I want to win it for my cousin's son and daughter Ricky and Cloey who would love it! I want to win this prize because my kids are huge fans of the Jurassic Park franchise. I would like to watch this with my nephew who loves dinosaurs. I'd like to win because I like these movies! I have only seen 2 out of the 5. Jurassic Park is my fav. I want to win because my family has seen every Jurassic Park movie and would watch them again and again. I want to win because this is the only movie in the series that me and my daughter haven't seen. I love the Jurassic movies and I would love to show them to my niece! I want to win these movies because my grandson loves dinosaurs and I would so enjoy watching these movies with him and seeing his eyes light up whenever he would see dinosaur. I would like to have it because we have enjoyed seeing several of the Jurassic Park movies, and it would be fun to see them all. My family loved the movie. My oldest son has been obsessed with Jurassic park since he was a kid. I want to win this so I can make my kids watch them all in order. That and we love movies at our house. I want to win this because I have never seen any of these movies and I would like to see them. I always enjoyed Jurassic World movies, so this collection would be so much fun to win and share. I would like to win these for my son to watch since he hasn't seen them. I want to win this because it would be a great set to add to my collection. I love watching movies and i'll watch them over and over. I would like to win this to see the movie! I'd love it for my husband and kids. I would like to win for our grandkids, they have not seen all of them. I would love to win this for my husband and kids. I love all the Jurassic movies they are very cool and good. I would love to win this for my son! He LOVES Jurassic Park! I'd love to win because my family loves dinosaur movies. And Jurassic Park has always been a fav for us. I'd love to win this because I grew up watching this and now I'm still enjoying it with my own kids. My sons love this movie. I would love to win this collection because my kids love dinosaurs and these movies. I would love to get caught up with these movies. I've see 2 or 3, but I'm not sure which ones these were. loved it when i saw it and would love this in my collection. I would love to win because i am a HUGH fan! I have been watching Jurassic Park since the first film debut. We love Jurastic Park! Our whole family could enjoy it together! We love watching these movies as a family so this would be nice to win. I would love to win this prize because my grandsons love anything dinosaurs and we have movie night and this would be a great movie for them. My sons love these movies. They would really enjoy these. My grandsons would absolutely LOVE me to be the winner! I would love to win this because I love the whole series, and I would love to add this to my collection. My son loves dinosaurs. I would love to share these dvd's with him. I want to win so that I can watch them with my family. I want to win for my son. He is a huge jurassic park fan and a dinosaur lover. I'd love to win so we can have an awesome family movie marathon! I haven't seen all of the movies before. This would be great to watch with my family. My little nephew would love this He is a huge Jurassic Park fan. I would love to win because I have only seen the first two and I would love to see the rest! I would love to win this because I have only seen the first one. This would be great for my husband, my daughter, and myself to watch together. My family loves these movies. Thanks for the giveaway. I haven't seen Jurassic World yet and would love to add this movie to my collection. We really want to watch this movie! My dad loves Jurassic Park, this would be nice to win for him. Jurassic Park is one of the first movies that I remember seeing in theaters! I love the music as much as the movie. Definitely would love to own the complete set!